During a rally in the Capitol Rotunda Thursday morning, Dave Adkisson, president and CEO of the Kentucky Chamber, spoke about the business community’s support of HB 190 – a comprehensive smoke-free law that will cover all indoor workplaces and public places in Kentucky. Gov. 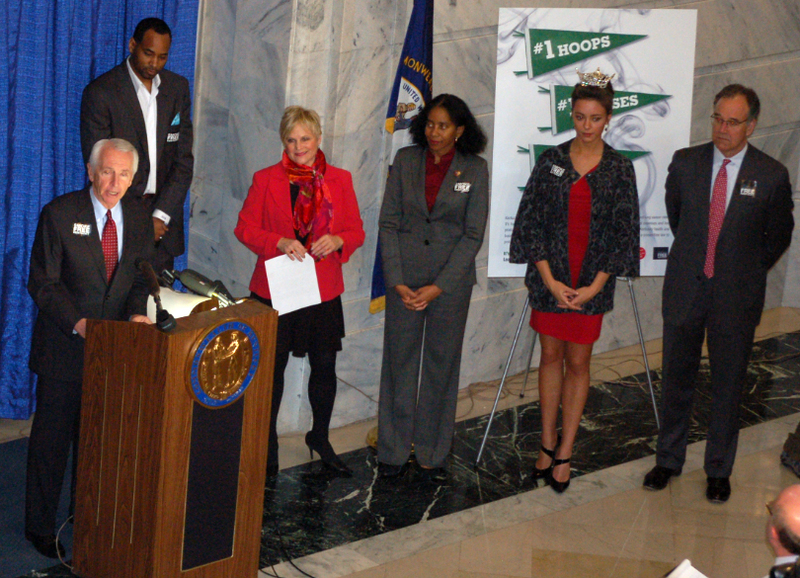 Steve Beshear and former UK and NBA Basketball great Derek Anderson spoke to hundreds of Kentuckians from across the state who gathered in the Capitol Rotunda to urge the General Assembly to pass HB 190. “Tobacco use costs the state’s economy $3.8 billion in health care costs and lost productivity. Passing a smoke-free law would be the very best thing Kentucky could do to improve our state’s poor health rankings. Smoking is costing employers in lost productivity, in their health insurance premiums and in their tax bills. This drain on our precious financial resources is preventable, and we need to take action now,” said Adkisson. The bill, introduced by Representatives Susan Westrom (D-79) and Julie Raque-Adams (R-32), overwhelmingly passed the House Health and Welfare Committee last week. Event participants, representatives of the 300+ organizations and thousands of individuals who are part of the Smoke-Free Kentucky Coalition, urged the General Assembly to pass HB 190 this session.